Click the link for additional information and Senior Ad order form. 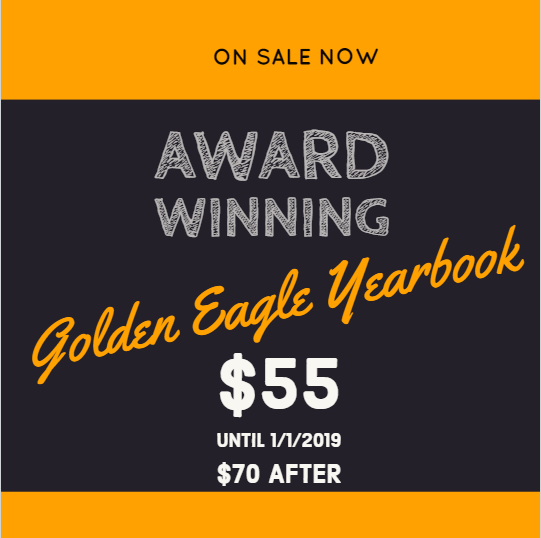 The 2019 Golden Eagle Yearbook is on sale for $55 now until January 1, 2019. The price will rise to $70 after January 1. A nonrefundable $20 deposit will reserve a book at the $55 price if paid before December 21. Students can come to room 212 to purchase a book or from a yearbook staff member. 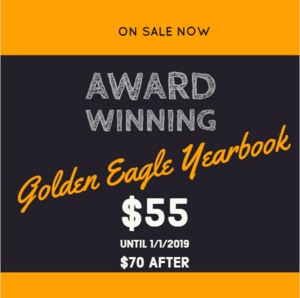 We have deals for purchasing old yearbooks. Due to requests from parents and seniors, the senior ad deadline has been extended into December. Order forms for a senior ad may be printed below or you may see Mr. Elledge in Room 212. Parents, seniors, and other students, please email Mr. John Elledge, Golden Eagle adviser, if you have questions or concerns.